Belzec was one of the three death camps purpose-built by the Nazis in the east of Poland as part of "Operation Reinhard", which was the code name for the most "industrialized" part of the Holocaust. 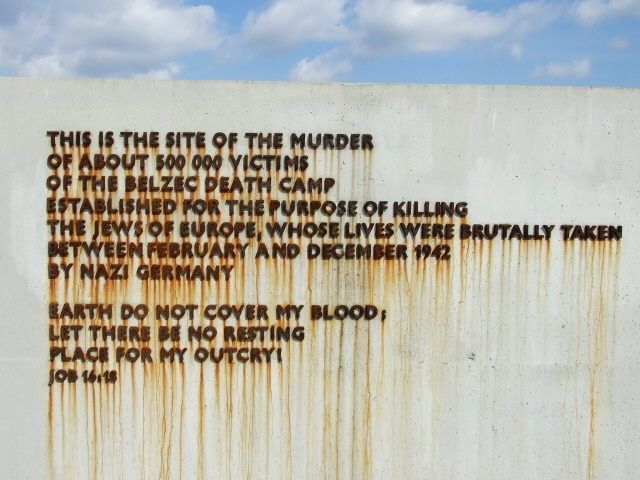 These camps, much smaller in size than the "regular" concentration camps, served solely for the mass murder of (almost exclusively) Jews, i.e., the "Final Solution" as it was dubbed in the Nazis' cynical bureaucratese. More background info: The camp at Belzec (pronounced "'bel(w)-jets", not "beltchek" as it is commonly mispronounced) was a pure "killing factory", like Treblinka and Sobibor. There had been a smaller labour camp in the small town of Belzec too, but that existed completely independently of the later death camp of Belzec. It was the first of the three camps specifically set up to implement Operation Reinhard, i.e. the "Final Solution", the systematic extermination of Poland's and Europe's Jews. From March 1942 victims were transported to the camp in freight trains and sent into the gas chambers immediately, without being temporarily housed anywhere first. 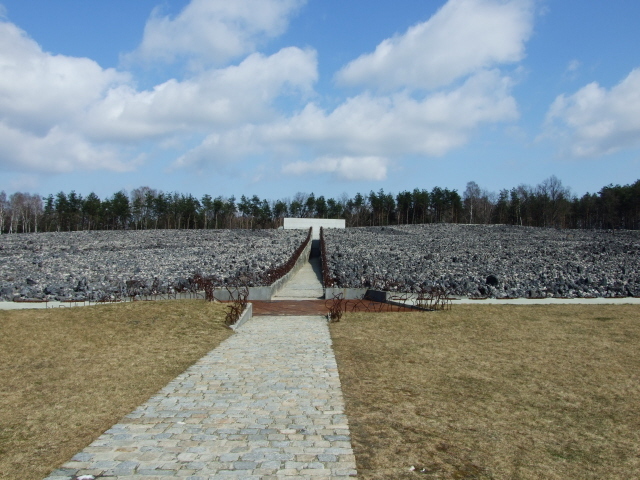 In the combined death camps/concentration camps such as Auschwitz-Birkenau at least the impression could be created that newly arrived people might be assigned to one of the barracks that lay beyond the selection ramp. Still, even at Belzec the illusion was created that the victims were simply passing through a transit camp and only had to be "deloused". 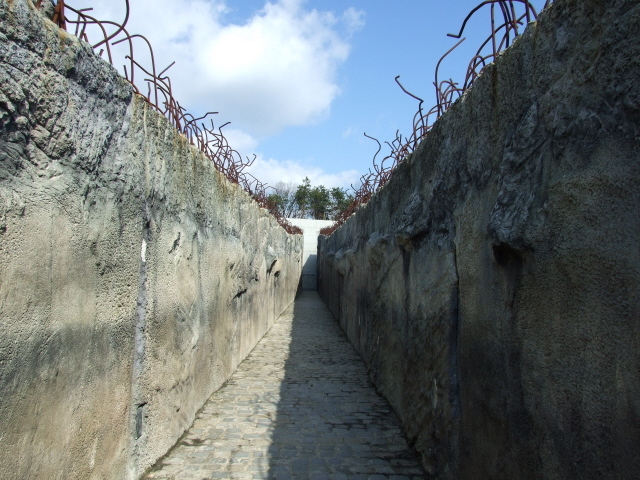 First they were herded into rooms where they had to undress, and from there they passed through the "Schlauch", literally 'hose' or 'tube' – an open passageway with high walls on either side, which led straight to the gas chambers. The gas used at Belzec was exhaust fumes from a specially installed engine, earlier pure carbon monoxide was used too (but never Zyklon B, as in Auschwitz or Majdanek). Afterwards, "Sonderkommandos", or 'special commandos' – groups of prisoners specifically selected by the SS for this purpose – had the gruesome task of emptying and cleaning the chambers and removing "valuables" such as gold teeth from the corpses. The corpses were then buried in huge mass graves. Often there were more corpses than the Sonderkommando could cope with, which repeatedly caused "operational problems" at Belzec. Normally, though, the whole process took only a couple of hours. When Belzec's evil task was complete by the end of 1942, the perpetrators set about covering up every trace of what had happened there. 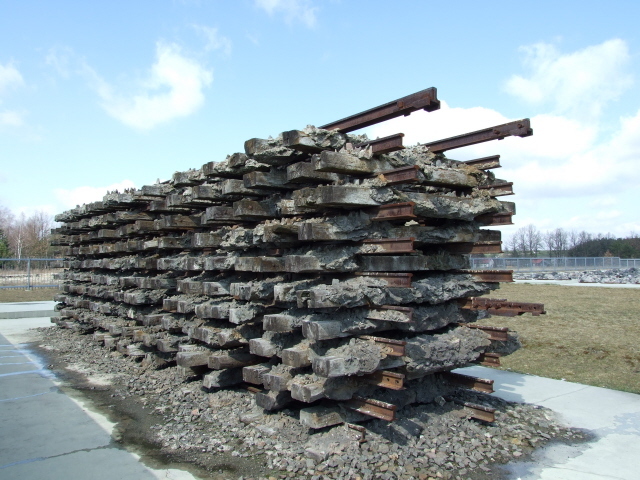 A large proportion of the buried copses were exhumed and cremated on racks made from railway tracks. All installations were dismantled and demolished. Trees were planted on the grounds and the whole place converted into a make-believe farm, in an effort to conceal its former real use. The killing machine of Belzec worked with an almost exhaustive efficiency which is unparalleled – there was only a minute number of survivors, and only a couple of these were still alive after the war. There exists only one proper eyewitness report from the point of view of a victim. And of the perpetrators, only a small number were ever brought to justice, as is the unfortunate norm with most such cases. Most of the perpetrators either lost their own lives in the subsequent years of the war elsewhere or successfully went undercover. Christian Wirth, the infamous first commandant of Belzec (and later overseer of Sobibor and Treblinka) was killed by partisans in today's Slovenia in May 1944. In the immediate post-war years, Belzec again caused outrage, namely when it became known that local residents had been active in ghoulish attempts at further looting remaining corpses from the camp's mass graves. The area was then fenced off. But a small memorial apart, the place remained comparatively obscure for many years. It was hardly tended and nearly got forgotten. That changed after the end of the Cold War, when more visitors from the West, in particular victims' relatives, wanted to come to the site. In the late 1990s the site was thoroughly examined archeologically, and finally a comprehensive reworking of the memorial was undertaken. The resulting new memorial was opened to the public in 2005. 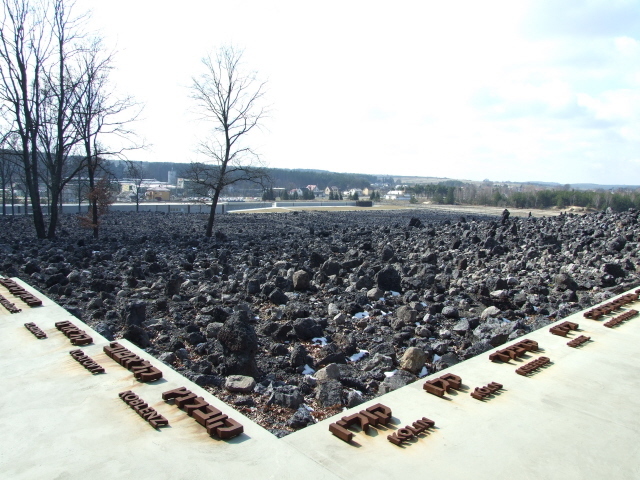 What there is to see: The present, newly reworked memorial takes in the entire area of the former death camp, which isn't big, but looks so striking, that it's hard to miss when passing by the old Belzec train station, where the road leading to the site branches off. The camp area extends up a slight uphill slope which has been covered with blocks of cinder. Encircling this area is a concrete path which roughly follows the outer perimeter of the former camp (ca. a 300 by 300 yards square). Set into this path are metal letters spelling out the names of the places that the victims had come from. Straight through the centre of the area another path is carved into the slope. This forms the most striking part of the memorial, in that it resembles the "Schlauch" ('hose', 'tube'), i.e. it kind of recreates the way into the gas chambers. 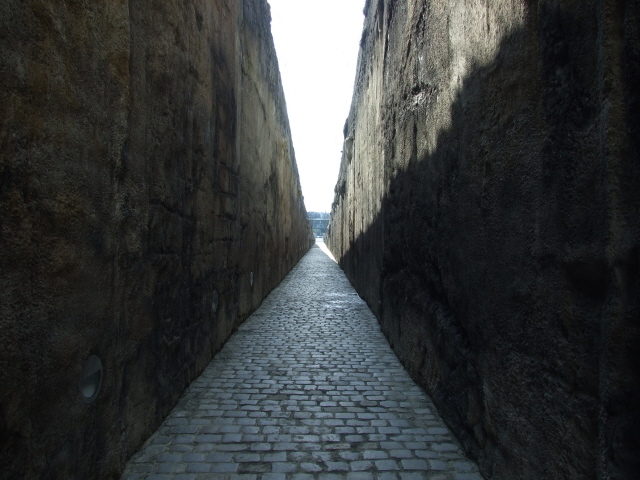 When walking into this horizontal path, the walls on either side rise and rise with the elevation of the slope around it … the oppressing effect being that you feel like you are entering further and further into a hellish darkness. It is indeed an impressive, though claustrophobic, experience. 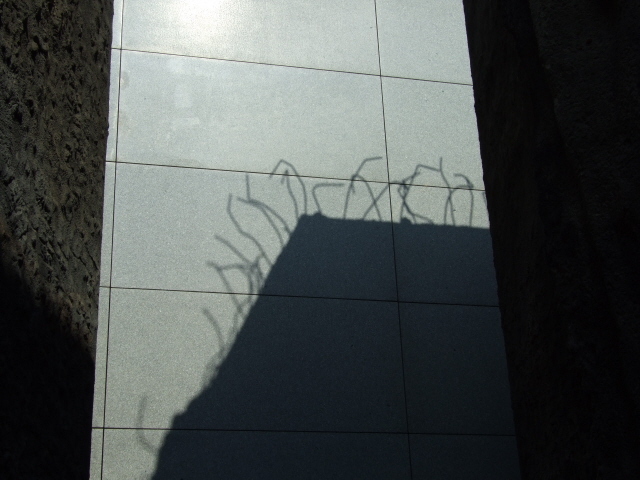 This grim effect is further enhanced by the edges of the "Schlauch"-path being marked by jagged metal spikes sticking out from the concrete. 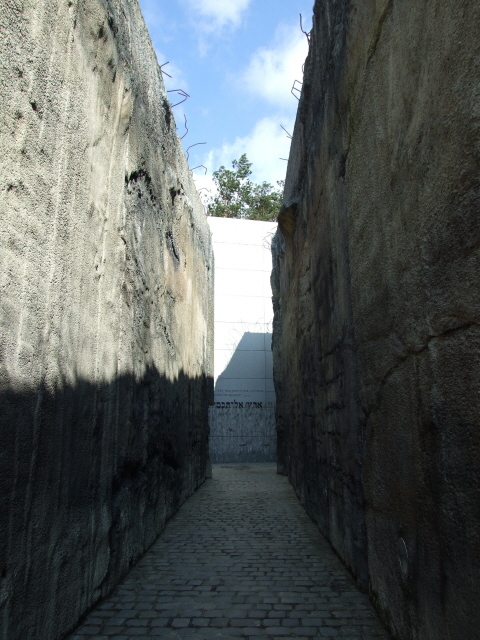 At the end of the path you reach a granite wall into which the names of victims have been carved, which serves as the silent centrepiece of the memorial, and is also the site where wreaths of flowers and candles are placed. After all, having walked the length of the path you have just passed through one of the largest graves on Earth. The soil of the slope still contains the remains of the countless victims. 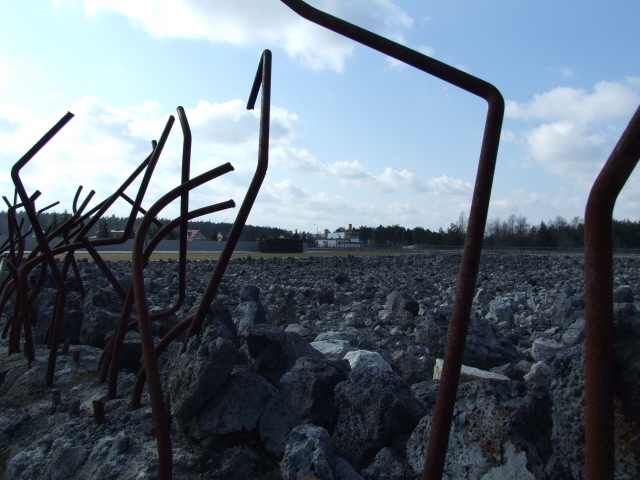 To the left of the main entrance to the site, a memorial structure has been erected which represents the pyres made from railway tracks used in the cremation of victims when the camp was dismantled. To the right of the main gate there is now a low-rise new building housing a museum. The entrance area leading down to the exhibition room proper takes up the theme of the "Schlauch" again. The exhibition itself recounts the history of the Belzec camp and the Holocaust in general, using pictures, explanatory text panels (in Polish, Hebrew and English), some artefacts and also some audio-visual material ... e.g. a video showing the confrontation with a former perpetrator whose undercover existence had subsequently been discovered. The museum is well-made, and small enough for it to be possible to take it in in its entirety. It provides a good and sober informative contrast to the memorial outside, which rather works on a more psychological level. 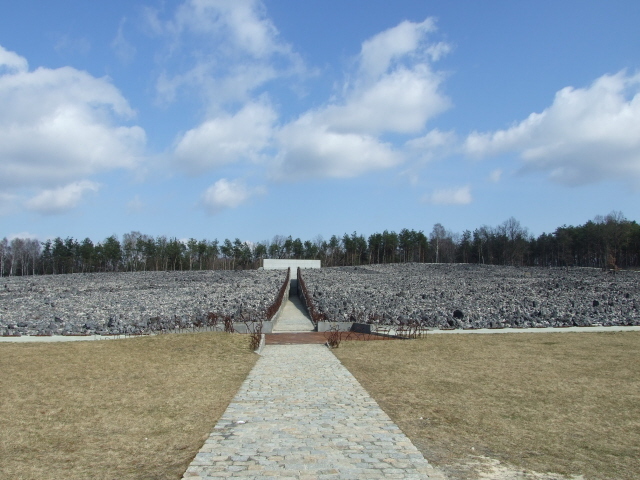 The comprehensive, and visibly expensive reworking of the memorial site (partly financed with money raised in the USA) has to be regarded as a success – especially if you compare it to sites like Sobibor or Chelmno that are still rather underdeveloped. 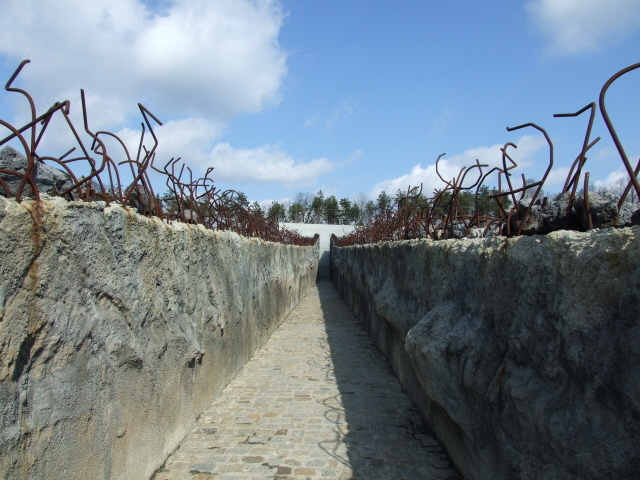 Overall, Belzec probably has to count as the best of the memorials commemorating the purpose-built Operation Reinhard death camps, and also as one of the most impressively designed Holocaust memorial sites anywhere in Poland. It is obviously a lot smaller and far less comprehensive in coverage than Auschwitz, and given its far more remote location will never draw similar visitor numbers. But for any traveller in Poland with a serious interest in the Holocaust the Belzec memorial should be very high on the list of priorities! Location: in the most south-eastern corner of Poland, near the Ukrainian border on the road to L'viv, about 30 miles (50 km) south of Zamosc, or 100 miles (160 km) south-east of Lublin. Access and costs: Quite remote, but manageable; free/inexpensive. Details: Unless you're on an organized tour, it can be difficult to reach this remote corner of Poland without a private vehicle (or taxi). 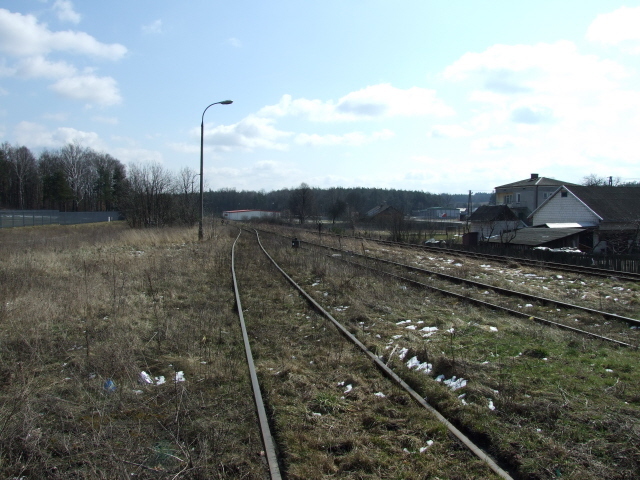 There is a train station in the village of Belzec, but as far as I could find out, there are hardly any connections these days. Bus connections are unlikely to be of much more help. So even if it should be feasible to get to this place by public transport, the effort, time and hassle it takes really suggests that you would be better off using your own means of transport. A small parking fee of 5 zloty is now levied. Admission free. Guided tours have are offered too but aren't really necessary. Whoever makes it to Belzec is likely to be rather well-informed already. In any case, the museum's exhibition does a commendable job in this respect. The main thing anyway is the psychological experience of the site and the pretty special way it is laid out. 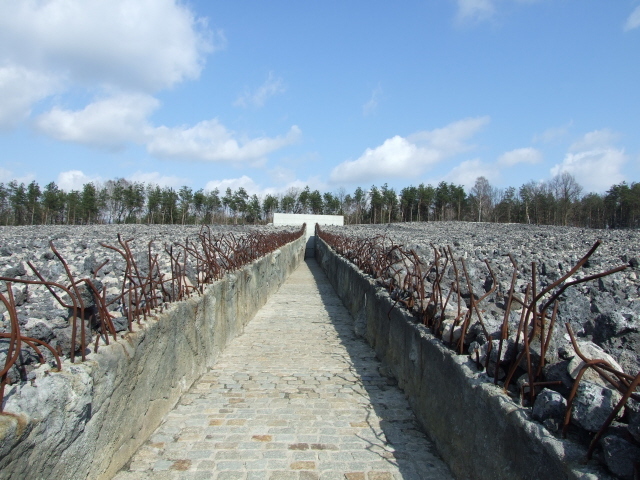 If you do want a guided tour, then book ahead through belzec.eu or phone (+48-84-665-25-10). Guided tours are available in English, last ca. 90 minutes and cost 100 zloty for up to 10 people (150 zloty for up to 30), half that for tours in Polish. Opening hours of the open-air site are: daily from 9 a.m. to 6 p.m. (in winter, November to March 8 a.m. to 4 p.m.); the museum exhibition is open 9 a.m. to 5 p.m. (in winter to 4 p.m.). Closed Mondays and on various Jewish and other holidays (check details on belzec.eu). Time required: You can more or less "do" the museum in about an hour. 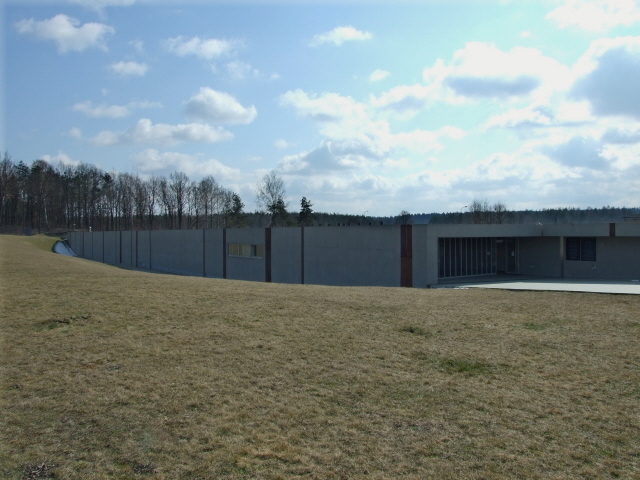 With regard to the open-air part of the memorial, the time to be spent here will depend on whether you only view the area from below, walk the length of the central "Schlauch" path, or even the entire outer perimeter path of the sloping camp area. All of this will normally take about another hour. Because of the remoteness of the location, though, a visit to Belzec will probably take the form of (at least) a half-day excursion (most likely from Lublin as a base). Combinations with other dark destinations: In general see Poland. There are no further sights developed for tourism in the immediate vicinity – however, the villa of former camp commandant Christian Wirth can still be found just across the road (although currently empty and inaccessible to tourists). 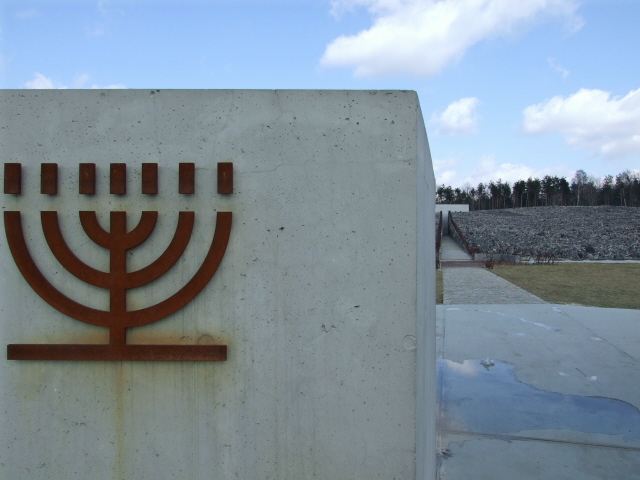 Since Lublin is the most likely base for excursions in the south-east of Poland, a visit to Lublin's own site in this category is the most obvious option: the combined concentration camp and death camp of Majdanek. Furthermore, the road from Lublin to Belzec leads past Zamosc – where the 'rotunda' near the centre houses a small museum about its dark past (i.e. the Nazi era). Lublin itself is also worth a good look around – for the dark tourist the city's castle should be of special interest – it too was used as a prison and execution site by the Nazis during World War II. In addition, there are many traces of Lublin's Jewish past still to be found in the Old Town. 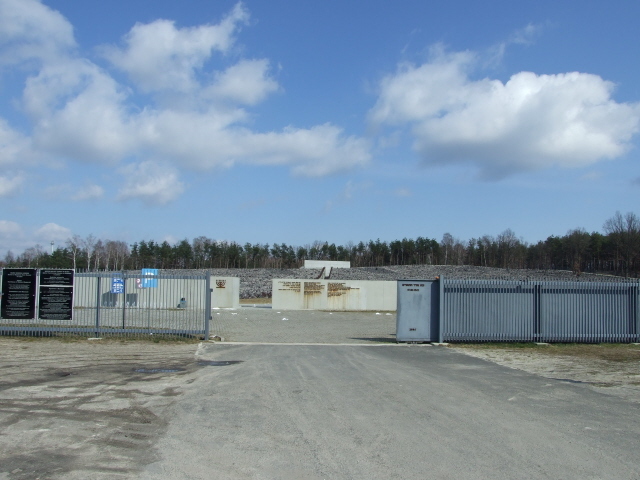 Moreover, from Lublin you could do a day excursion to the site of another of the three death camps of Operation Reinhard, namely Sobibor. Combinations with non-dark destinations: The immediate area around Belzec has nothing to offer that could be of interest to tourists, except perhaps the pretty old town of Zamosc. Lublin, on the other hand, likely to be the base for a trip to Belzec anyway, has rather more to offer (see under Majdanek).